Sometimes I would like to get away from the hustle and bustle of the city. In my dreams I am a little girl again living out in the country where the wild flowers grow. I remember that many spring mornings I would jump out of bed and run outside to gather flowers for my mom. 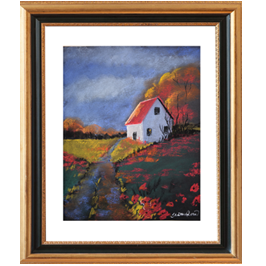 I believe Farmhouse on the Prairie captures those carefree moments. Done in soft pastels, you will now be able to recreate this gentle scene. You will be gaining experience in drawing with perspective and shading.